We were all up early to catch buses out of Queenstown to our respective places. Becky, Tom, and Calvin headed back up to Twizel while Griggs and I went to Wanaka. It was nice our buses boarded at the same time so we could all say our goodbyes at the bus stop. For sure an emotional goodbye. We all had high hopes of spending so much more time together, so we are still accepting this sudden change that this will most likely be the last time we see each other on this hike. 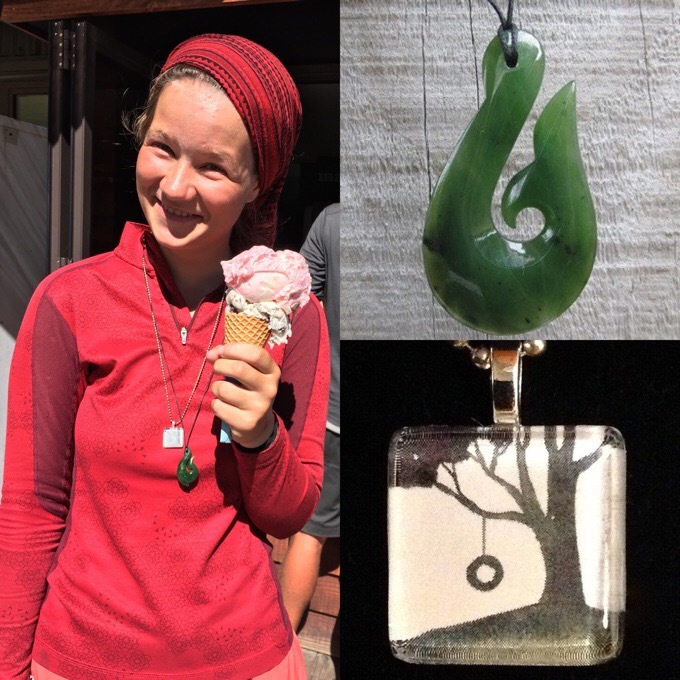 I was too nauseated yesterday to give due time to this story, but yesterday, for Becky’s birthday, I gave her a pendant on a necklace of a silhouette of a tree with a tire swing hanging on it, and Tom (a kiwi) gave her a greenstone Hei-matau pendant. Mine was less for wearing and more to have as a keepsake. It included a letter (written on the final map page of the Te Araroa) of why I sought out this pendant. Swings in trees are sentimental favorites for us, and symbolize so much about our time together and this hike. The first full day we hiked together, we took a memorable break at a tire swing, and it was the beginning of a truly special bond, and many more breaks spent on swings. It was only fitting that we did the world’s biggest swing in tandem yesterday to bookend this time together on the TA. 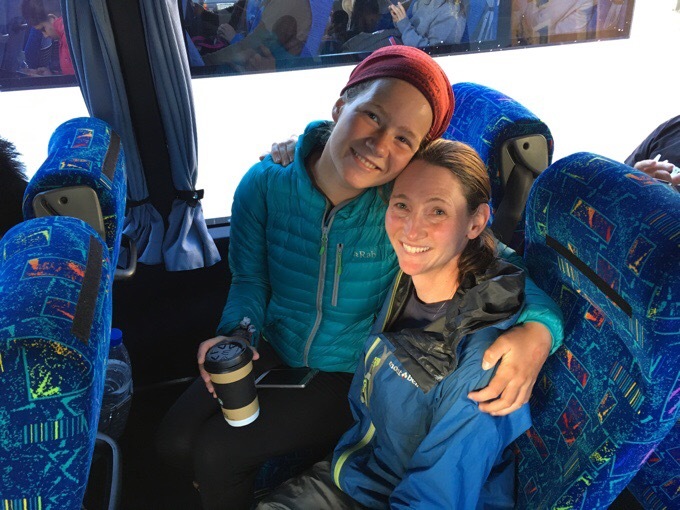 This morning, as we were parting, Becky let me know that she plans on getting her second tattoo before she finishes the trail. Since the beginning, she’s said that she wants to get one that represents the TA. She has decided that it will be a tree with a tire swing hanging from it. Awww!!! I told myself I wouldn’t cry saying bye to her, but she didn’t play fair telling me that one just as we were parting. She almost did it last night while they were out, but she knew the mom in me wouldn’t have wanted her to do anything impulsively. As if telling me that wasn’t enough, she wants the tattoo to include the words, “Keep on swinging” written in MY handwriting. There really are few words to describe how much we mean to one another, but that gesture that Becky will have that the rest of her life shows how mutual the impact has been. It leaves me at a loss for words. It’s terribly sad to part ways, and I admittedly had some misty eyes while hiking today, but I know I made the right choice for all of us. I’ve tested and broken many friendships by trying to compromise hiking styles that don’t match, and I see where this could end if I forced this. This isn’t the end, and we will always be bonded and care about each other. I have to view it as many things in trail life. The people I meet and sights I see usually aren’t things I can literally take with me, but I can still be greatly impacted by them, and carry them with me forever. So with that, we parted ways possibly for the final time in NZ. So bittersweet. 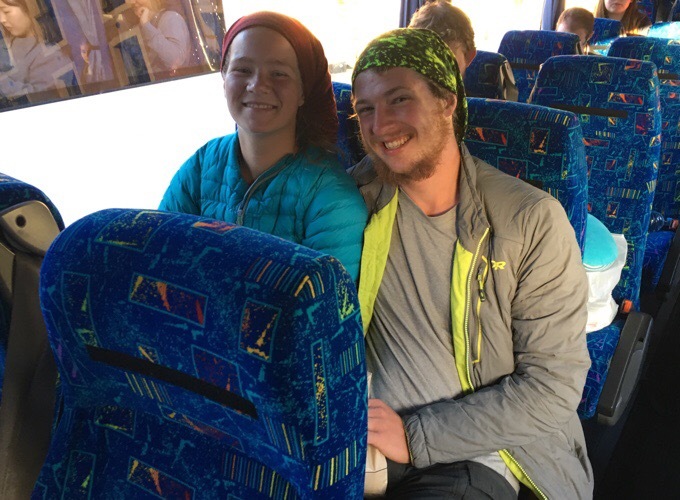 Becky and Tom do both have hopes of doing the PCT in 2018, so there is hope of seeing them in the US someday soon. I live not far from the trail in Oregon. I’m sure we’ll always be in touch in someway, and I’ll surely continue to relay updates as they complete the South Island. Farewell Tom and Becky! Soak it up you two! Happy trails Becky and Tom! 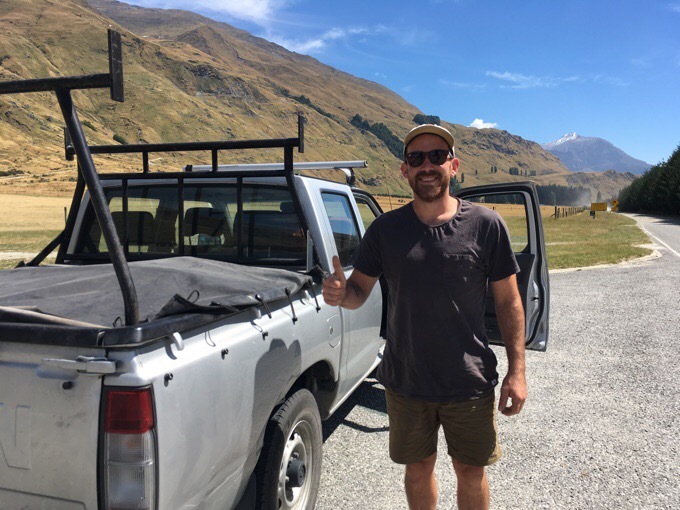 As for today, Griggs and I took the bus for a couple hours into Wanaka with the plan of hitching into Mt Aspiring National Park. 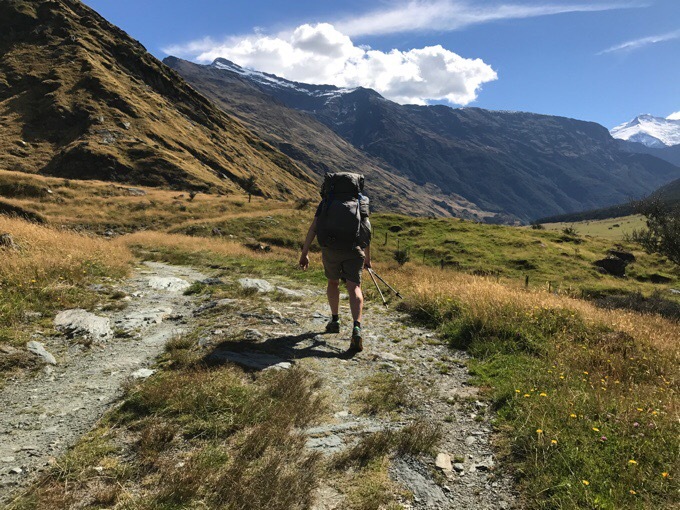 We will do a popular, yet logistically challenging, multi-day link that connects the tracks of Cascade Saddle and Rees Valley to then get a shuttle to Glenorchy, and from there get another shuttle to the Routeburn Track (one of New Zealand’s 9 Great Walks), to then connect to the Caples Track, which connects back to the TA where we left off. Whew! 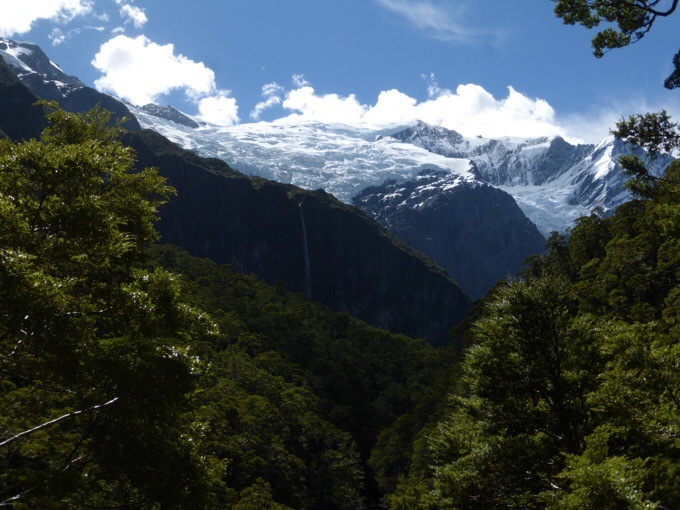 That’s Cascade Saddle-Rees Valley-Glenorchy-Routeburn-Caples-Te Araroa. We knew there would be a triathlon happening in Wanaka when our bus arrived, but didn’t realize that it fully closed off the road to the trailhead. Fortunately, it was reopened just after noon, so we found a spot to sit and wait an hour or so before hitching. We walked over to where they’d be opening the road to the park to find a line of cars waiting to take off towards the popular trail heads. It was a hitchhiker’s dream! We just walked down the line and asked people if they could give us a ride. About five cars in, we met a guy (forgot his name) who was going the trailhead half the ~1.5hr hitch for us. Good enough! He was a paraglider like the ones we saw over Queenstown yesterday. He explained the logistics of how they hike up to certain destinations and take off, landing sometimes hours away depending on how the winds and air are. Griggs, who really loves planes and flying, may have found his new passion. He’s seriously going to look into this type of recreation. We were dropped off at the point where the road changes from pavement to gravel, so it was perfect to grab a car slowing down. After less than 5mins, a woman named Michelle stopped to give us a ride the rest of the way. Michelle is going on her first solo trip in decades, and it was inspiring to see her going for it while her husband and teenage kids are all otherwise occupied. We started off from the Raspberry Creek trailhead at 2pm. 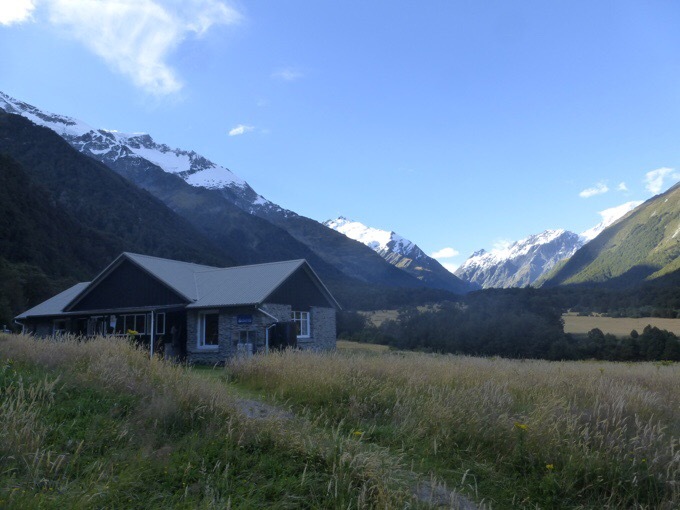 It’s 2-3hrs walk to our destination at the Aspiring Hut, along the West Matukituki River. 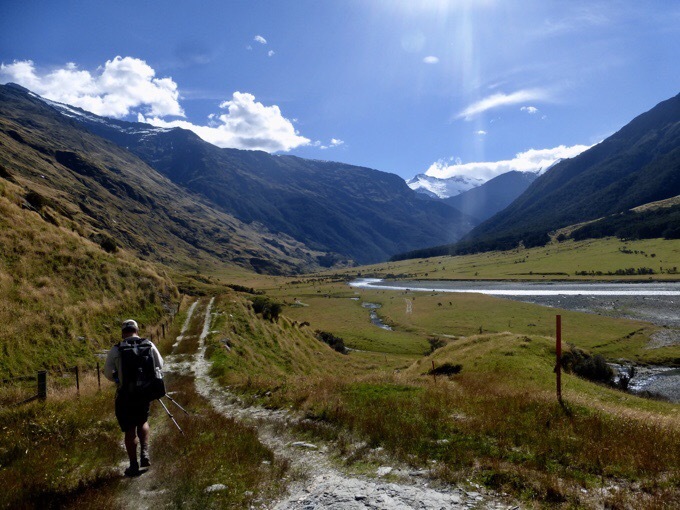 Along the way is a side trail that goes out and back 2.5mi/4km each way to see Rob Roy Glacier. We made it up in about an hour, and it was totally worth the side trip. Pictures don’t do something this grand justice at all. Griggs was totally pumped by the view and had a full monologue on how amazing it was and how random it is that we are humans and able to take in such a sight. When he gets excited, he talks really fast and uses words and adverbs I’ve never heard before, so I only caught bits and pieces. His vocabulary is insane, and I wish I had hit the record button so I could have dictated all of what was said. I do know somewhere in there was mention that we are merely hairless apes and somehow our eyes are able to view photons or something. It was pretty entertaining. 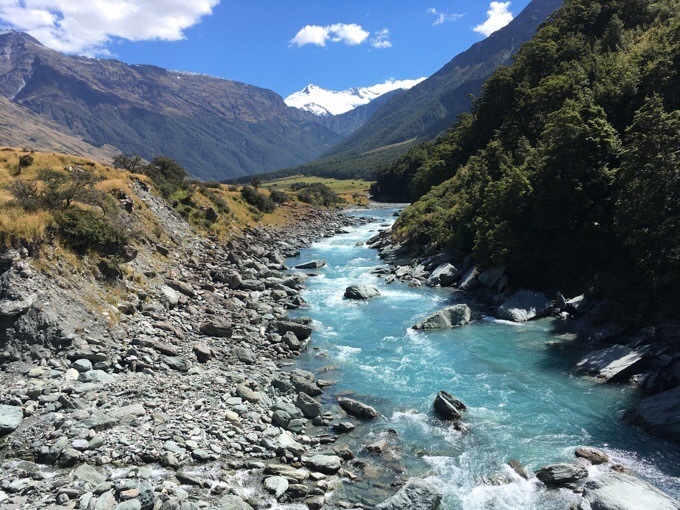 We finished up the side trail to Rob Roy Glacier and went up the West Matukituki River Valley towards Aspiring Hut. While walking, we saw Michelle, who gave us a hitch to the trailhead, taking a break under a tree. She was so enthralled by the scenery that she did a bit too much from the carpark. 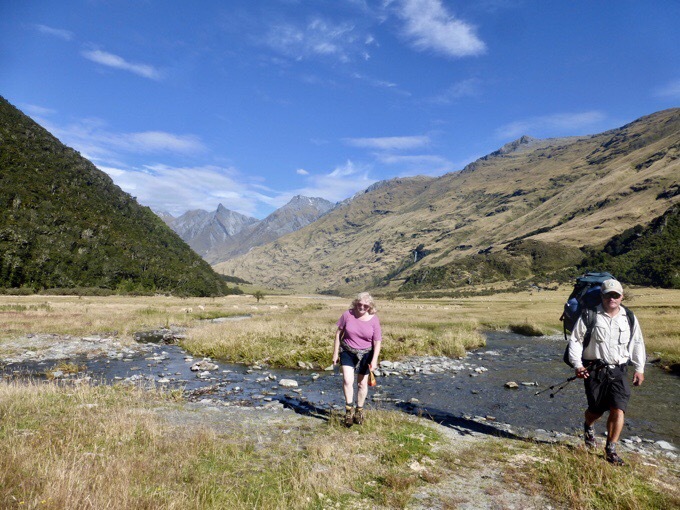 She had quite a heavy pack, and did the uphill climb to the lower view of Rob Roy Glacier and back. With about 3mi/5km to go to the hut, she was pretty knackered and conserving water since she didn’t have a filter. We walked a bit together and were able to filter more water for her. She had contemplated just going back to her car and driving home, but we discouraged that idea since she was so close to such an awesome hut and scenery. She joked that her trail name could be Dozy Wombat for her silliness in coming out and doing too much too soon and not having certain things. It was just a bit further, so we split up her gear into our packs and Griggs put her almost empty one on top of his. Then we all walked to the hut together and had a great time. We were so thankful to be able to do something for her since she has given us the hitch to the trailhead. She’s learned a lot from this first trip out, and we didn’t want it to discourage her. Everyone has to start somewhere, and this is a perfect trip to do for that. It was so great that she got out and did it! Yay, Michelle! 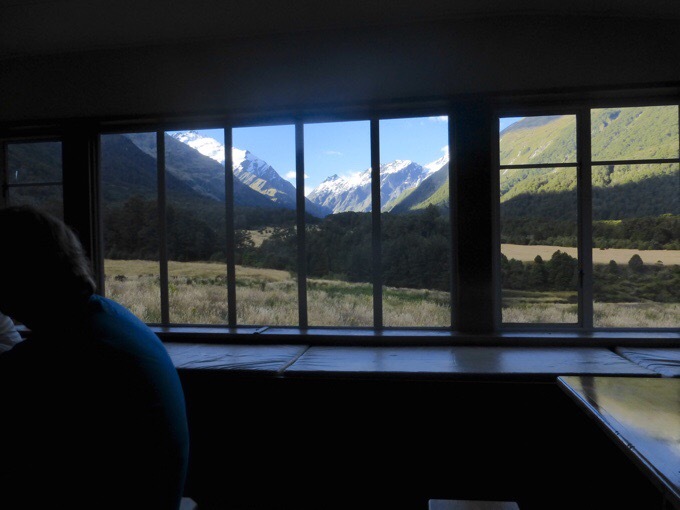 The Aspiring Hut is in a spectacular setting. 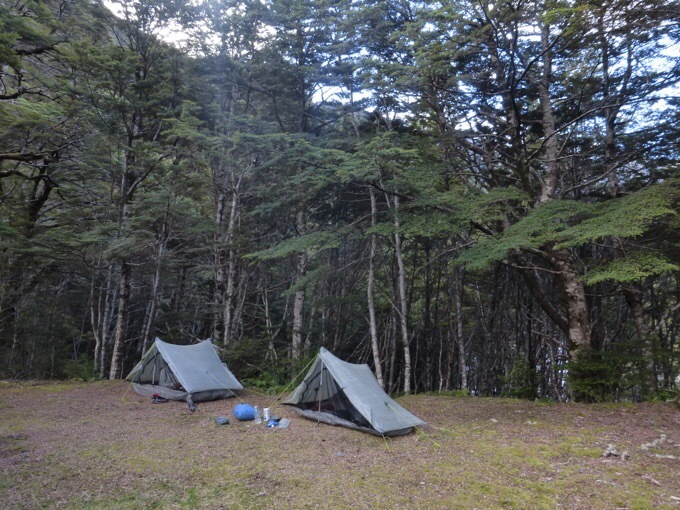 It has 38 bunks and requires a higher fee, so we chose to tent for $5. There were spots in a grassy field, but we chose a nice spot in the nearby woods with the white noise of a stream running behind it. I’m not feeling well at all and barely got dinner down. All day I’ve felt like I’m recovering from the stomach flu and I have very low energy and feel weak. I only ate breakfast yesterday and a bar at night because I got nauseated from all the modes of travel we’d done. I woke up still having some lingering nausea and have eaten less than I should have. Tomorrow is a BIG elevation day, and I’m hoping a good night of sleep will help me feel more rested and calm my stomach issues. I know I’m not sick. It’s just all the cumulative travel after yesterday and then the bus and hitches today. Hope you feel better soon – you have too much to see to get sick now!! Your pictures are beautiful. So glad you got to “play it forward” with Michelle. I knew you’d like the tattoo idea Katy! I love it. It’s such a sweet tribute and a really fun idea. I hope she finds a an artist that can do it justice! Cheers to the adventure ahead!! Yeah, it’s been a lot! A sad ? farewell .. I have tears in my eyes . But you have formed a bond with Becky that is there forever … and she’ll be carrying you with her wherever she goes ( via her tattoo ). That is such a meaningful gesture . Once again you have finished a day at the top of the world .. great views .I hope you can shake that nausea before too long . .
Wow, Erin!! 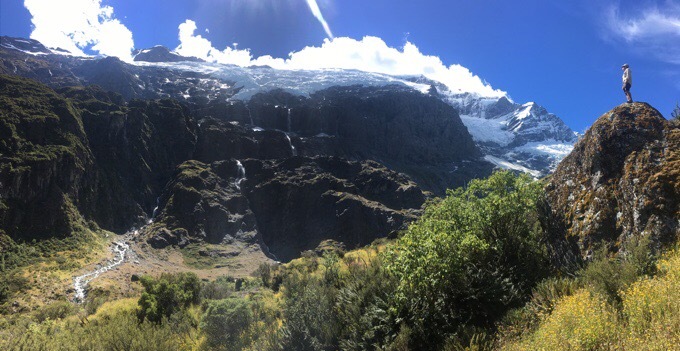 Your pictures of the glacier are so beautiful!! Must have been completely awe inspiring in person!! Thanks for sharing! 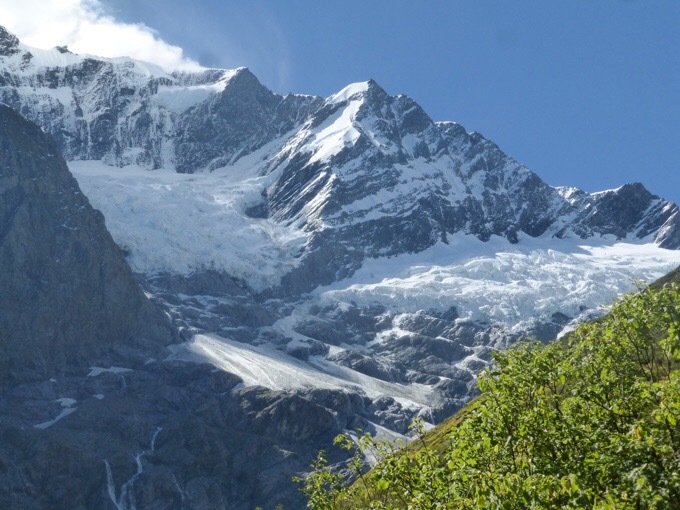 The glacier and glacial meltwaters are ethereally and majestically beautiful! Such a great post!! Becky’s tattoo idea made ME cry.. that is truly a special bond that you two share. 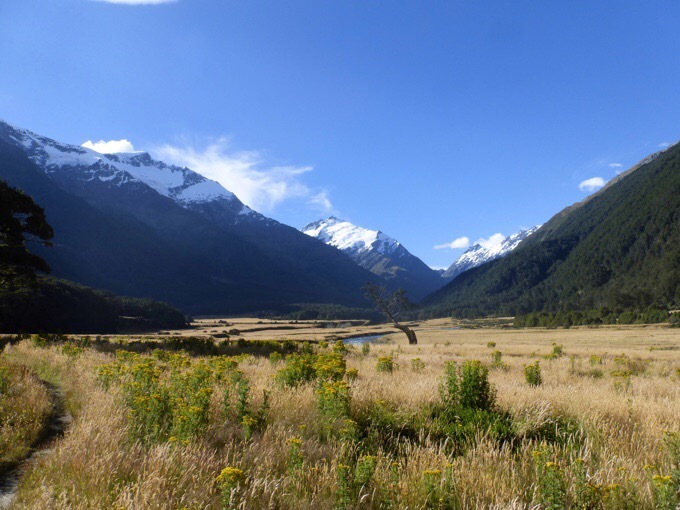 The views from this day are spectacular too, really reaffirmed my desire to visit NZ. Also love that you guys got the chance to help out a fellow hiker, so awesome! Hope you got a healing night of sleep..
And.. They say you are on a continent.. This was such a special post. Got a big ole’ lump in my throat just reading your lovely narrative. The Tree Swing Tattoo is surely a tribute. I think that all of us would be so honored as to have found a friend that let us know we meant that much to them by making it permanent for all to see. These are the blessings of the highest order. 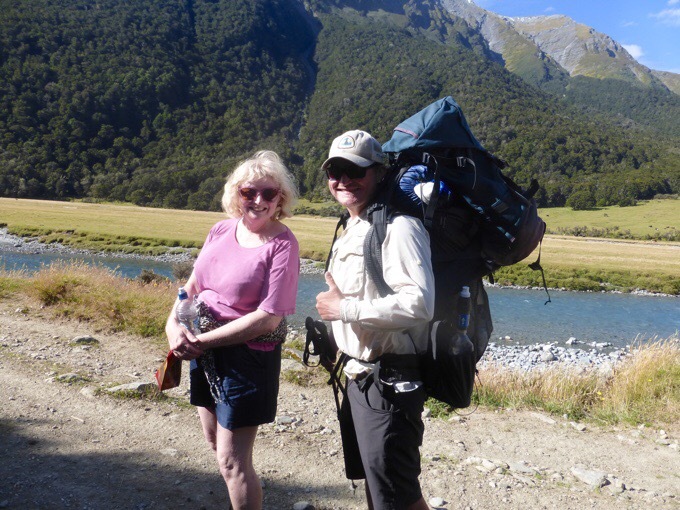 I am also so impressed and inspired to see that Griggs and yourself helped Michelle to get to the hut. You may have just changed her life for ever. She’ll never forget the experience and who knows who she’ll affect in the future because Griggs and yourself took the time to be kind. Tell Griggs that he is not only a Monster Hiker, but a Monster mentally and spiritually too. Men of Character are far and few between; I wonder if I could have done that (being physically able and such). Erin, your blog is a real highlight for me each time I read it. I couldn’t possibly say “thank you” enough. Finally, Miquel is right. All the roads you’ve traveled have led to this very emotional end. It will imprint on you the importance of being true to yourself and to those that are closest to you. This is the kind of treasure we should choose to build up, it is the only treasure that will help us through this long journey of life. Erin, that is a moving post, and you are a very special person. Hope to hear more Becky updates though, from time to time. I will email your walkingwithwired address shortly..
Oh, so sweet and sad…you put it so well in words. I love this post. 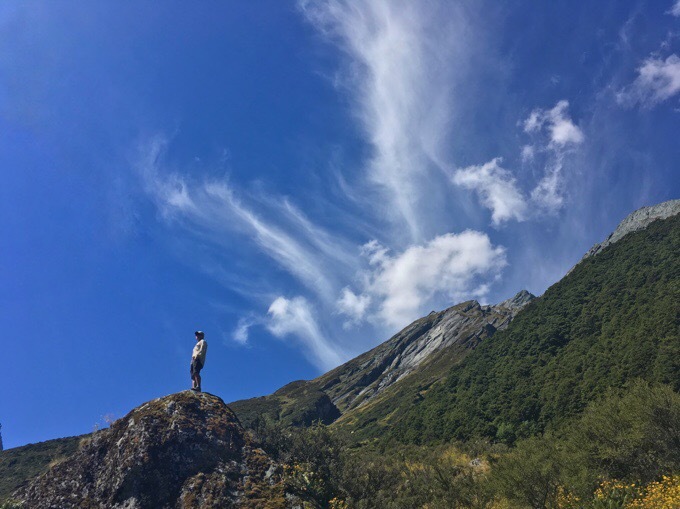 The Becky story, helping out a new hiker, the stunning photos. The mountains remind me vaguely of Switzerland.